The 4th Annual Noiseless Chatter Xmas Bash!!!! is over! …and that’s all for another year! I was hoping to hit $1,000 tonight, but we hit $1,190! I love you guys! Many, many thanks to everyone who participated, watched, chatted, donated, assisted…well, many thanks to everyone in general. This was a great year, and it was probably my favorite mix of specials yet. I hope you enjoyed it. Let me know your personal highlights in the comments. Have a truly great holiday. Whoever you are, whatever you celebrate. Enjoy it. And know that I appreciate you deeply. Posted on December 17, 2016 Author Philip J ReedCategories xmas bash6 Comments on The 4th Annual Noiseless Chatter Xmas Bash!!!! is over! GO NOW: The 4th Annual Noiseless Chatter Xmas Bash!!!! The chat is open! 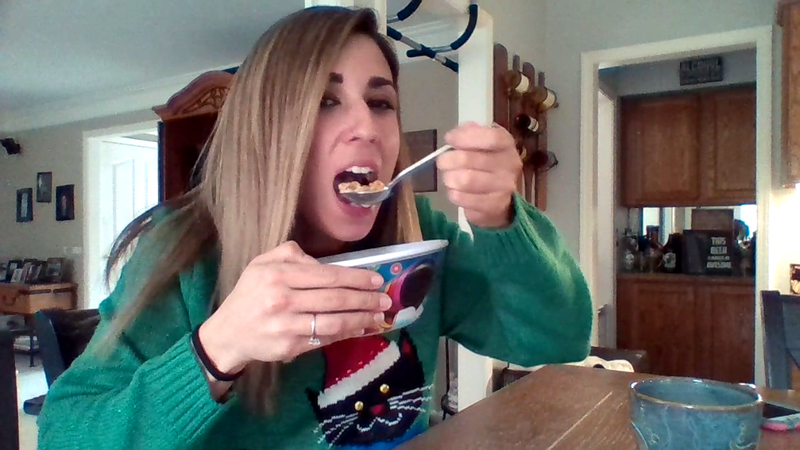 The live stream itself begins at 5 pm Mountain / 7 pm Eastern time, if you get there early, but this gives you time to register an account, settle in, and reflect on your life choices before I bombard you with seven terrible Xmas specials that we’re all watching for a good cause. As always, technical difficulties may occur. If they do, I will post an update on this page. Be sure to come back here if the stream goes dead. Please be patient if that happens…I promise a backup is coming! Posted on December 17, 2016 December 17, 2016 Author Philip J ReedCategories xmas bash1 Comment on GO NOW: The 4th Annual Noiseless Chatter Xmas Bash!!!! 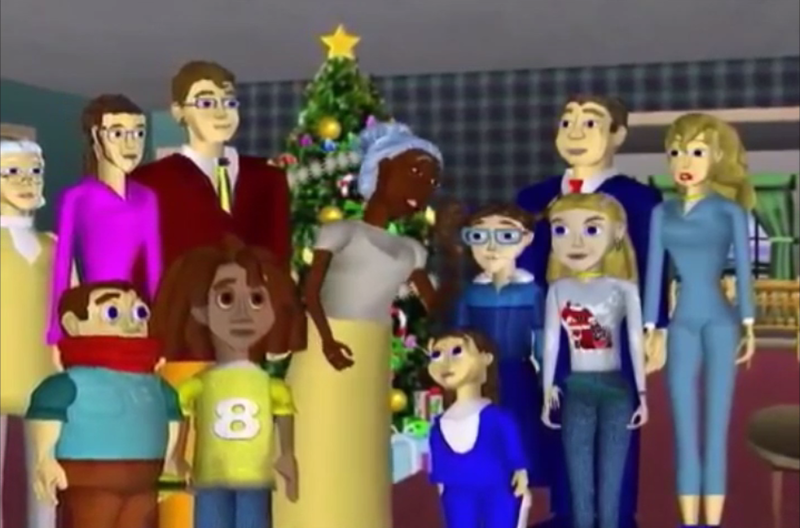 Choose Your Own Advent is a yuletide celebration of literacy. We’ll spotlight a different novel every day until Christmas, hopefully helping you find one you’d like to read in the new year. When I decided to do this feature, I made a list of all the books I would conceivably want to include. I hit twenty-four easily, as you might imagine, and every book on that list felt right. Each of them, indeed, was one that I wanted to write about. That I wanted to share. That I felt belonged. Except for one. This one. 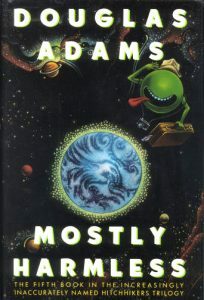 Now, I’ll make this clear: I like Mostly Harmless. Quite a lot. My reasons for second guessing it have nothing to do with its quality…except maybe in a relative sense. It’s not Douglas Adams’ best work. (That would be Dirk Gently’s Holistic Detective Agency.) It’s not even the best book in the Hitchhiker’s Guide to the Galaxy series. (That would be Life, the Universe and Everything.) It’s not a book that stands out even to his fans, and if it does it’s probably because it’s one of their least favorites. But I put it on my list. Before I really started thinking about it, when I was just spitballing titles and seeing what came up, I put it on my list. And I think it’s because it taught me something important. It will always have a place in my heart for that reason alone. Before I get to that, though, I do have to reiterate that I genuinely do love the book. 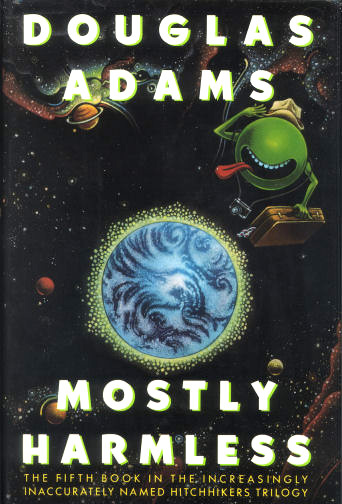 I think it’s just about as funny as anything Adams wrote, I think it offers a great (if abrupt, and rather dark) ending to the series as a whole, and I think it’s just good. It probably also helps its reputation in my mind that it follows on from the rather dreadful So Long, and Thanks For All the Fish. I remember reading the first four Hitchhiker’s Guide books in a collection when I was in my teens. I loved the first three…and couldn’t believe how disappointed I was in the fourth. I had to do some research to discover that there even was a fifth book, and I bought it as soon as I could. Because I love Mostly Harmless. It ended the series on a higher note. It gave me a qualitative kind of closure, even if we can argue about the value of that closure in a narrative sense. When I reflect on the series as a whole, one of the moments that stands out to me above any other is a sequence from this book, in which Arthur Dent–aimless, luckless refugee from a destroyed Earth–slides into the quiet life of a professional sandwich maker. After four full novels of adventure, absurdity, cosmic mysteries, confounding truths, dangerous scrapes, bizarre (and insulting) alien creatures, and maybe at least a little bit of single-handedly saving the universe, Arthur finds himself at peace. It’s a perfectly bathetic conclusion to his adventures, and the fact that it’s not exactly his conclusion does nothing to hinder its perfection. If Arthur Dent could have chosen to stop, that’s indeed where he would have stopped. Making sandwiches. One of the few things he’s ever been truly good at. He’s seen the literal end of the universe, and yet is happy to surrender to the repetitive comfort of a simple joy. It’s probably not a highlight for many of Adams’ fans. For me, it’s a highlight of reading in general. But that’s still not why I decided to write about this one. See, when I read Mostly Harmless, I did something I can’t actually imagine doing today: I wrote a letter to thank the author. It’s important to remember what things were like then. Now we can tweet at authors. Leave a post on their Facebook page. Email their agents. We can do whatever we like, however we’d like to do it. In a sense, I think, that means less. Back then, I had to look up an address for him. (I have no idea how I found it. I may have just written to the publishing house.) I had to sit down with a sheet of paper, get my thoughts together, and write them down. I had to buy postage. I had to mail it off, and hope that the international mail service would get it where it needed to go. Here’s something else interesting: I forgot I wrote to him. I only remembered years later, when he wrote back. I think I was in college at the time. I got a letter from an unfamiliar address overseas. It was from Douglas Adams. But he did more than that: he wrote me a letter in return. Yes, I can confirm that I enjoyed the book more than its author did. It’s important to remember what I was like back then, too. I was a kid. I didn’t read much. I wasn’t well-spoken. My handwriting was terrible, and I am one thousand percent sure I had nothing interesting to say or to share with him. Of all the things in the world that he could have spent his time reading, he chose to read my letter. Because he appreciated it. And then he actually took more time out of his day to write back. To this day, I remember what it felt like to get his letter. I remember I felt like the most important, fortunate guy in the world. I’m sure that’s why he took the time to reply. In the years since, people have told me that that’s just who he was. He’d get fanmail, and he’d sit and read every piece, and respond to them, taking as much time as it took. He must have made a lot of people feel like the most important, fortunate people in the world. That’s the definition of a hero. He died in 2001. He wasn’t even 50. The world lost a beloved man who seemed to love all of his fans just as much in return. His letter changed me. As a person, and as a writer. I’m nowhere near as famous as Douglas Adams was. I wouldn’t dare say I’m anywhere near as talented, either. But I get fanmail, too. And comments. And Facebook requests from people who read something I wrote on some site at some point and want to connect, for whatever reason. I make it a point to be gracious. To let them know I appreciate everything they took the time to say. (And I really do.) To thank them for reading, because I know that reading anything I write is an investment of time on their part, and I want to be respectful of that. I’m not Douglas Adams. I very likely never will be. But if I can make anybody in this difficult world feel even a little better when they hear back from me…I’m going to do it. Reminder: 4th Annual Xmas Bash!!!! is TOMORROW! This is your final reminder! The 4th Annual Noiseless Chatter Xmas Bash!!!! is tomorrow! Come a little early to join the chatroom, but don’t be late! We will start promptly. Probably. 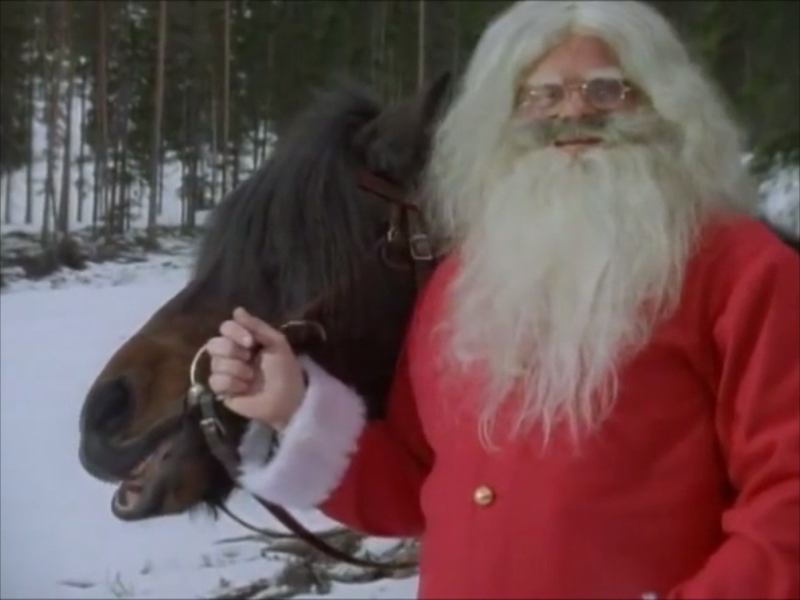 It’s a live stream of seven rightly forgotten Xmas specials, loads of holiday music you won’t hear anywhere else, vintage commercials, magic, AMANDA, and lots more. The stream is FIVE FULL HOURS long, and it’s full of things you will never see again. In any other context. For good reason. It’s free to attend, but we will be soliciting donations to The Trevor Project. That’s optional, and all donations are appreciated. 5 p.m. Mountain / 7 p.m. Eastern. The Xmas Bash!!!! comes once a year. Posted on December 16, 2016 Author Philip J ReedCategories xmas bashLeave a comment on Reminder: 4th Annual Xmas Bash!!!! is TOMORROW! I thought I’d write about Gravity’s Rainbow. I really did. It’s my favorite novel (full stop), and God knows I can ramble on endlessly about it. This would be the easiest entry to write. Hell, in my head, I’ve already overwritten it. 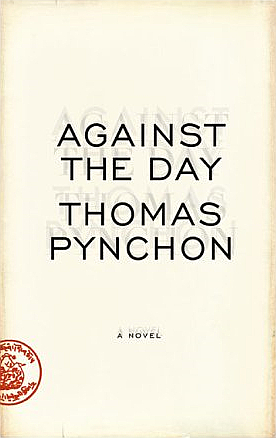 And if I didn’t write about Gravity’s Rainbow, maybe I’d write about V., Pynchon’s first novel. Or The Crying of Lot 49, which is the first novel of his that I read. Or Bleeding Edge, as it’s his most recent. Or Vineland, which is the novel of his I recommend the most to new readers. Maybe Inherent Vice, since I re-read that recently and might like to talk about it in a context other than comparing it to the film. Or Mason & Dixon, since the warm friendship at its core fits so well around the holidays. In short, I genuinely didn’t expect to be writing about Against the Day…a book of his that I’m not even sure I like. It’s overlong. It’s messy. It’s full of long stretches in which nothing interesting happens, and which often do little more than spew historical reference points. It raises great ideas and neglects to follow through on them. Its threads often fail to cohere. It’s too busy, too dense, too confusing. But it’s also full of brilliance. Not consistent brilliance, but it’s there, and when it is, it’s true brilliance. Against the Day isn’t for a reader looking for a great novel, but it will reward readers by being an intermittently great novel. That’s not why I’m writing about it, though. If I wanted to celebrate Pynchon’s greatness, we’d both be better served if I looked almost anywhere else. No, I’m writing about it because I read it again this year, my fourth or fifth time, probably, and I saw something in it that I’d never seen before. A theme, and an important one, made itself apparent. And the book became something else to me. Not better, necessarily. But something different. And as I read with this theme in mind, I found myself experiencing a version of Against the Day that I had not before. And all of that is still in there. So much more is there as well. But this recent time…I found something else. Something that I needed to find when I found it. Something that helped me to understand the book in a new way, and maybe to understand myself. It was time. Specifically, our inability to conquer it. We are always at the mercy of time. And reading the book through that filter, every moment took on a new meaning for me. Sometimes because it very specifically tied into the theme. Other times it was just because the theme reminded me that these moments, any of these moments, all of these moments, would never happen again. Everything is temporary. Everything ends. Pavilions set up to be dismantled. Cities whose cultures are destroyed by tourists. Civilizations that met a nasty end long before we were around to observe or record it. Battles we are destined to lose. Rebellions fated to be crushed, by those who are later crushed themselves. Ambitions that bring us so close to progress that, at once, are torn down by those who don’t wish to understand. A child’s doll left behind. A particular sunset we’ll never see again. A train pulling out of the station and the knowledge that whoever is present will never be here, never exactly here, again. All that will exist will pass. All that exists now has already passed. Tomorrow will pass as well. We can’t help it. We can’t stop it. Our lives, as we live them, are pulling away. I recognized it early in the novel this time, as one character reflects on his daughter getting a haircut. The narration fixes us within his mind, within his sphere of observations, as we learn about the barbershop, how it looks, where it’s located, what it smells like, the kinds of people who frequent it, what else goes on here, and then…it’s over. The haircut is over before we ever really saw it. We let ourselves get distracted. We looked around. We occupied our time with other things. And that moment was gone before we even thought to live it. The simplest little thing, inconsequential, unimportant, becomes consequential and important simply because we missed it, because it’s one of many things we are destined to miss, because one day we, too, will die, and so much of our lives will have passed without us even thinking to pay attention. That character’s little girl moves away. Not even all that far into the book. Not even all that many years later. A few blinks of the eye. A few nights nobody thinks to prolong. One day, she will be gone. And he won’t have this memory of her, because he didn’t think to pay attention. 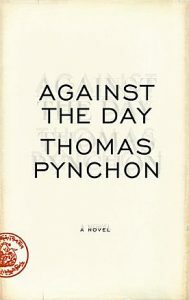 I believe Against the Day is Pynchon realizing that he won’t live forever. That he’s an old man now, and that the vast majority of his life, his creativity, his productivity, is behind him. Against the Day is his meditation on his own mortality, in the only way that he can meditate: by having lots of characters crash into each other and stumble around and work hard to find some kind of direction that always–always–seems to elude them. Against the Day becomes a deeply sad book if you read it like that, but it also, to me, became a more important one. It’s a jumbled reflection on a lifetime’s worth of missed, forgotten, and ignored moments. For everything you remember, there’s more that you forget. For everything that you do, there’s more that you don’t. For everyone you meet, there are more missed connections that could have changed everything. His novel even features characters that don’t grow up…that are frozen, in a sense, in time. Forever young, as the world ages around them. It must be nice, Pynchon may think, to be able to float above…observing…recording…touched by emotion but untouched by time. In one scene, two dogs meet. One of them lives in the city, and has dreams of flying. The other lives on an airship, and dreams of living on the ground.